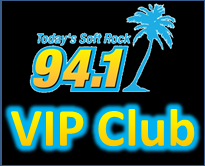 Today’s Soft Rock 94.1 LOVES our loyal listeners and we like to show it! We randomly choose our VIP Club members to win various prizes like movie passes, concert tickets, festival passes and so much more! To join our VIP Club and be eligible to win VIP Club exclusive prizes, CLICK HERE.